Sally Hobart Alexander is a writer of considerable talent and resourcefulness. 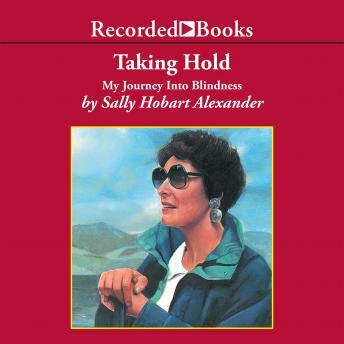 Taking Hold: My Journey Into Blindness is her powerful autobiography of tragic illness and spiritual triumph. At 24, Sally Hobart was a schoolteacher, engaged to be married, and living a happy, active life in southern California. Waking up one morning, she discovered that a gray cloud had descended upon everything around her. A trip to the opthamologist's office revealed that she was suffering from a retinal hemorrhage. Several treatments later, her sight steadily deteriorating, Sally began to understand that soon she would be completely blind. With courage and conviction, Sally has struggled to overcome her visual impairment, and her story is one of great inspiration. With Suzanne Toren's sensitive narration, Sally's story overflows with emotion and determination.